Age of Sail fighting ships, miraculous and improbable weapons, questions of loyalty and patriotism, with antagonists earthly and uncanny. A wise reviewer described this historical fantasy as Patrick O'Brian's Captain Aubrey series seen through the lens of Hayao Miyazaki, which is just about right. Return to Nagspeake for a new fantasy adventure from the bestselling author of National Book Award nominee Greenglass House. Lucy Bluecrowne and Maxwell Ault are on a mission: find the three pieces of a strange and arcane engine they believe can stop the endless war raging between their home country of England and Napoleon Bonaparte’s France. During the search, however, their ship, the famous privateer the Left-Handed Fate, is taken by the Americans, who have just declared war on England, too. 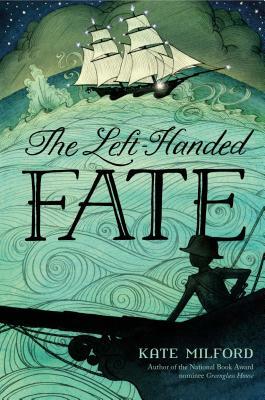 The Fate (and with it, Lucy and Max) is put under the command of new midshipman Oliver Dexter . . . who’s only just turned twelve. But Lucy and Max aren’t the only ones trying to assemble the engine; the French are after it, as well as the crew of a mysterious vessel that seems able to appear out of thin air. When Oliver discovers what his prisoners are really up to—and how dangerous the device could be if it falls into the wrong hands—he is faced with a choice: Help Lucy and Max even if it makes him a traitor to his own country? Or follow orders and risk endangering countless lives, including those of the enemies who have somehow become his friends? Kate Milford is the author of The Boneshaker, The Broken Lands, The Kairos Mechanism, Bluecrowne, andGreenglass House, which was long-listed for the National Book Award. Originally from Annapolis, Maryland, Kate now lives in Brooklyn, New York, with her family.